Join our new Tiger 800 Photos Gallery. Upload your photos, create albums, and easily embed the images into your forum posts ! General Tiger 800 chat, but NOT subjects covered in other boards. Topics in this board must be Tiger 800 related ! Do NOT post servicing or mechanical or maintenance issue here. Anything relating to maintenance and servicing of your Tiger 800 - oil changes, adjusting chain, etc. Anything to do with Electrics, Lights, and Wiring. Also, includes electrical issues of ancilliary components and connectors. in Re: 2018 XRT TPMS ? Discuss your ECU mapping here, including Re-Maps, TuneECU, TigerTool, mapping software, and any associated questions/queries. Home of the infamous tyre threads ! Discuss your tyre and wheel issues here. Also includes wheel/tyre removal and fitting. Technical Tiger 800 articles created by forum members. Access restricted to MEMBERS only. Need help with something not covered elsewhere in other sections ? Post it here. Chat about all types of insurance for your Tiger and you. Includes road insurance, GAP insurance, and travel insurance. General talk about anything "Off-Road"
Discuss any after market Parts and Accessories. Dealers/Manufacturers CANNOT post here without prior agreement. Do NOT discuss mechanical/electrical issues here. Chat about your tech toys like Sat Navs, Cams, Intercoms, and other types of gadgets. Discuss motorcycle clothing, helmets, and apparel. Club-discounted Bike policies from Bikesure. 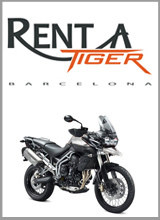 "Rent a Tiger" for guided and self-guided tours in Spain, Morocco, and beyond....! Unique Motorcycle stands from MonnTek. Chat about all aspect of Touring plus post your Ride Reports here. Also, includes things like touring tips and advice, suggested routes, recommended places to stay, etc. Try to add pics of your trips if possible ! Was it you? "Spotted" a Tiger 800 in your travels? Tell us where ! FULL MEMBERS ONLY. Pronounced "Caf" ! The place for all non-bike related discussions, i.e. general chat, jokes etc. Please keep it CLEAN ! Only FULL MEMBERS (with 12 posts +) have access to this board. (It will appear empty to Guests and others). Board dedicated to the 2018 Autumn meet in North Wales. Links to road tests and reviews of the Tiger 800 on external sites. This section is now closed to new topics as it was relevant when the bike was new. Tiger Explorer 1200 - now "Read Only"
Initial chat about the Tiger Explorer 1200 when it was originally launched. This board is now "read only". If you wish to know more about the Explorer then please use the link below to visit our dedicated Explorer forum. Link to the our international Tiger Explorer forum. This is our sister forum with over 5000+ members and over 175,000 posts ! Why not join both ! List your your items for sale here - bikes, clothing, parts etc. Post here if you have any problems/questions relating the forum. Link to the old Gallery area. This is now READ ONLY and will be discontinued soon. Submitted photos and details of the 2015 Tiger 800 Calendar Competition. This board is now "Read Only" as the competition has ended. Submitted photos and details of the 2014 Tiger 800 Calendar Competition. This board is now "Read Only" as the competition has ended. Submitted photos and details of the 2013 Tiger 800 Calendar Competition. This board is now "Read Only" as the competition has ended.